The Ganges River, Indus River and oceans surrounding India. The Ganges River is the most famous of India's important river systems and bodies of water. It's the longest river that originates in India and it forms the North Indian River Plain, an area that includes most of Northern and Eastern India, parts of Pakistan, Nepal and all of Bangladesh! 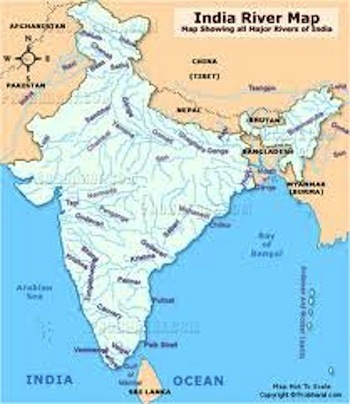 It also flows east through the Gangetic region (which is named after the river itself) of the North Indian River Plain. The river rises in the western Himalayan Mountain Range, and drains into the Sunderbans Delta, located in the Bay of Bengal. Its depth averages at about 52 ft, but it's about 100 ft deep in some areas. The Ganges River Basin drains 39,400 square miles and supplies water to one of the world's most densely populated countries. 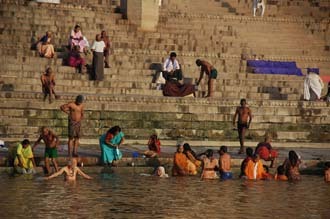 Hindus consider the Ganges to be a holy river and many consider it to be India's National River. It was named after the Hindu Goddess Ganga, due to its life sustaining importance. India is mostly surrounded by bodies of water. The Southwestern side of India borders the Arabian Sea, which is part of the Indian Ocean. It has India to the east, Pakistan to the north and Iran on its western side. The surface area of the Arabian Sea is approximately 1,500,000 miles and it gets to be 15,262 ft deep. The Indus River is also really important to India because it was the birthplace of the Indus Vally Civilization, which was the first Indian civilization, and one of mankind's first civilizations. The Indus River is the largest in Pakistan, and flows directly into the Arabian Sea. Additional rivers in India include the Netravathi, Sharavathi, Narmada, Tapti and Mahi Rivers. Many rivers of the state of Kerala, India also flow into the Arabian Sea. Kerala's coast along central India is called the the Konkan Coast, and its coast along southern India is called the Malabar Coast. The Indian Ocean is enormous! It's the world's third largest ocean and makes up about twenty percent of Earth's water. It lies directly at India's southernmost tip and is the only ocean that was ever named after a country. To its north is South Asia, on its west side is Africa, east of it is Indochina and Australia, and to its south is the Southern Ocean, near Antarctica. The Indian Ocean is more than 6,000 miles wide from the tips of Africa and Australia, and it covers an enormous area of over 28,000 square miles. India's lower east side meets with the Bay of Bengal. The Bay of Bengal is considered the most northeastern point of the Indian Ocean. The Bay of Bengal is the largest bay in the entire world and Its borders are defined by Bangladesh to the north, India and Sri Lanka to the west and Andaman and the Nicobar Islands and Burma to the east. These bodies of water and river systems of India make it possible for the country to sustain the world's, soon-to-be, largest population! Leave Ganges River and Indian Bodies of Water explore the geography of India.